Century Motorsport have been a dominant force so far this season in the BARC Saxmax Championship winning every round so far with 2012 runner up Guy Wenham. The winning team welcomed a new arrival at Oulton Park in the shape of Martin Poole. Enduring a disappointing start to the championship running off the road, Poole was keen to put that behind him with a fresh start at Mallory Park. Qualifying conditions at the Leicestershire circuit proved to be tricky to say the least with a drying track meaning drivers had to constantly adjust to the conditions. Continuing his dominating form Guy Wenham was the man to beat taking pole position by 0.6 seconds clear of team mate Martin Poole who was showing that his Oulton Park excursion was clearly having no negative effect on the Preston based driver. 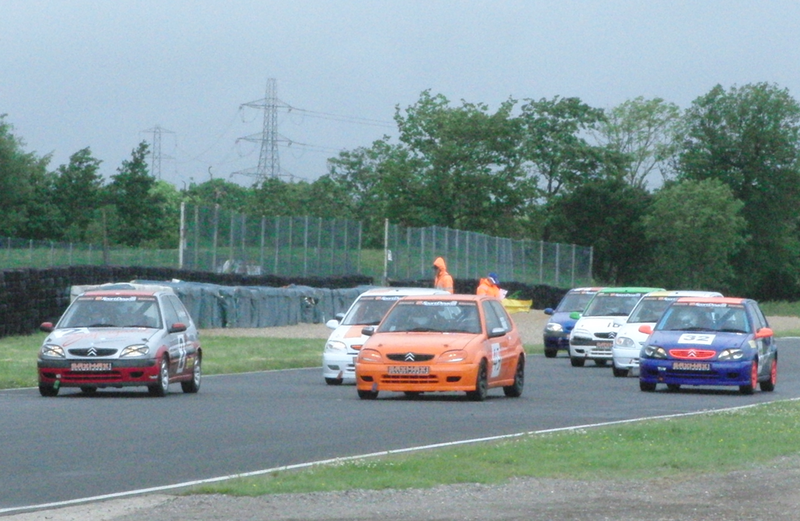 Race one was somewhat routine for Guy Wenham who lead from the off and quickly started to build a considerable margin at the head of the field. Martin Poole in second made a challenge for the lead on the opening lap but quickly had to turn his attentions to defending his second place from rivals James Dorlin and Tom Parker. A mistake by the latter followed allowing Poole & Dorlin to battle it out for second for the remainder of the race. Now 12 seconds clear at the front, Guy Wenham crossed the line to take his fifth win of the season. Martin Poole did a superb job to ensure he remained in second crossing the finish line to make it a Century Motorsport double podium at the head of the field. Sunday afternoon’s race two would be a lot more dramatic for the Century Motorsport drivers. A poor start for Wenham earned him a ten second jump start penalty while Martin Poole felt he was too slow off the line allowing James Dorlin to take his place at the first corner. Wenham’s pit crew made him aware of the penalty and as he went about trying to make up the ten second deficit, he fell foul of the tricky wet conditions at the first corner half spinning his Citroen Saxo. This allowed Dorlin into the lead followed by Century teammate Martin Poole back up into second. Regaining his composure, Wenham set about getting back into the lead as quickly as possible. In what turned out to be a fantastic battle for the three podium positions, Wenham managed to get past Poole at the Hairpin to move into second. On the next lap a similar move at the Hairpin again put Wenham back into the lead of the race and now with clear track ahead of him to try and open a ten second advantage. A very clever Martin Poole took advantage of Wenham making his move on Dorlin at the hairpin to follow him through and move back into second just behind teammate Wenham. However Poole’s race was far from over as he was now under pressure from Tom Parker. In a similar fashion to Wenham’s earlier slide, Martin ran wide at the fast first corner dropping him back to fifth. However within just three corners the Preston driver was now back up to second as Guy Wenham had now built an advantage of over ten seconds at the head of the field to counteract his jump start penalty. As the chequered flag was prepared a clearly delighted Guy Wenham crossed the line to take his sixth race victory from six races, easily his most challenging victory so far this season. Following him home for another superb finish was Martin Poole awarding Century Motorsport a brace of double podium finishes at Mallory Park.